A Jewish convert to Christianity and polemical writer against his former religion; born 1270; died 1348, or a little later (Grätz). As a student he acquired a certain mastery in Biblical and Talmudical studies, to which he added an intimate acquaintance with Peripatetic philosophy and even with astrology. He was graduated as a physician at the age of twenty-five, but throughout a long life he seems to have found the struggle for existence a hard one. Not being of those contented ones who, as Moses Narboni says in his "Maamar ha-Beḥirah" (Essay on the Freedom of the Will; quoted by Grätz, p. 488), are satisfied with a peck of locustbeans from one Friday to another, he resolved to embrace Christianity though at the advanced age of sixty, according to Paulus de Santa Maria ("Scrutinium Scripturarum"); according to other writers he took this step soon after he was graduated in medicine. The only point certain from the statements of his contemporaries is that he was converted, not from spiritual conviction, but for the sake of temporal advantage. Something of the apostate's pricking conscience seems to have remained with him, however, although he was immediately rewarded with a lucrative sacristan's post in the prominent Metropolitan Church in Valladolid (whence he took the name of Alfonso of Valladolid). In an essay entitled "Iggeret ha-Gezerah" (Epistle on Fate), he sought to disclaim responsibility for his act of apostasy by setting up the remarkable plea that man's actions are ruled and compelled by planetary influence, and that therefore there can be no option or free will for mortals. Both his conversion and this defense aroused general and fervent protests from his quondam Jewish friends, protests marked by great bitterness. Isaac Pulgar, to whom Abner had dared to send a copy of his attempted justification, returned it with a biting satire referring to the Biblical test of the adulterous woman (Num. v. 11-30). Deeply stirred by the wordy war ensuing, Abner was not slow to make his vindictiveness felt, and in a direction where it would most keenly be experienced. He presented charges before the just and energetic Alfonso XI., king of Castile, accusing his former brethren of using a prayer-formula in their ritual which blasphemed the Christian God and cursed all Christians. The prayer referred to was a formula that had been used only in olden Roman times, when the early Jewish converts to Christianity persistently molested the Jews. 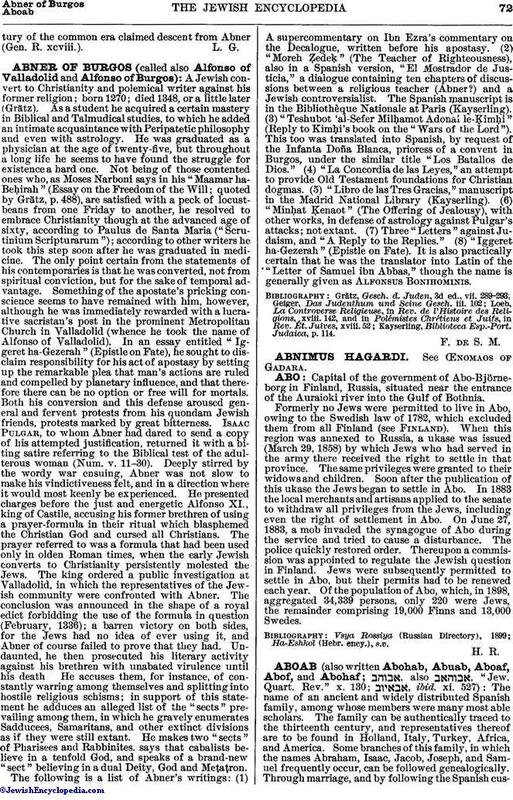 The king ordered a public investigation at Valladolid, in which the representatives of the Jewish community were confronted with Abner. The conclusion was announced in the shape of a royal edict forbidding the use of the formula in question (February, 1336); a barren victory on both sides, for the Jews had no idea of ever using it, and Abner of course failed to prove that they had. Undaunted, he then prosecuted his literary activity against his brethren with unabated virulence until his death He accuses them, for instance, of constantly warring among themselves and splitting into hostile religious schisms; in support of this statement he adduces an alleged list of the "sects" prevailing among them, in which he gravely enumerates Sadducees, Samaritans, and other extinct divisions as if they were still extant. He makes two "sects" of Pharisees and Rabbinites, says that cabalists believe in a tenfold God, and speaks of a brand-new "sect" believing in a dual Deity, God and Meṭaṭron. The following is a list of Abner's writings: (1) A supercommentary on Ibn Ezra's commentary on the Decalogue, written before his apostasy. (2) "Moreh Ẓedeḳ" (The Teacher of Righteousness), also in a Spanish version, "El Mostrador de Justicia," a dialogue containing ten chapters of discussions between a religious teacher (Abner?) and a Jewish controversialist. The Spanish manuscript is in the Bibliothèque Nationale at Paris (Kayserling). (3) "Teshubot 'al-Sefer Milḥamot Adonai le-Ḳimḥi" (Reply to Kimḥi's book on the "Wars of the Lord"). This too was translated into Spanish, by request of the Infanta Doña Blanca, prioress of a convent in Burgos, under the similar title "Los Batallos de Dios." (4) "La Concordia de las Leyes," an attempt to provide Old Testament foundations for Christian dogmas. (5) "Libro de las Tres Gracias," manuscript in the Madrid National Library (Kayserling). (6) "Minḥat Ḳenaot" (The Offering of Jealousy), with other works, in defense of astrology against Pulgar's attacks; not extant. (7) Three "Letters" against Judaism, and "A Reply to the Replies." (8) "Iggeret ha-Gezerah" (Epistle on Fate). It is also practically certain that he was the translator into Latin of the "Letter of Samuel ibn Abbas," though the name is generally given as Alfonsus Bonihominis. Kayserling, Biblioteca Esp.-Port. Judaica, p. 114.